Microsoft announced it will deploy major releases for Windows 10 every 6 months: once in March and once in November. The announcement came quietly packaged with a blog post on Office 365 ProPlus – basically, Windows 10 update will align with Office’s enterprise apps now. “It’s quite the change from the old days when we had to wait years for significant new Windows features, and even macOS only gets big updates every year or two. But it’s part of Microsoft’s goal to establish Windows 10 as a service and respond quickly to user feedback,” writes TheNextWeb. For businesses, the upside is that major releases will be less drastic than upgrading from Windows XP to Windows 7 to Windows 10, and, that there is a predictable 6 monthly rhythm. The downside, however, is that every 6 months all applications need to be tested for compliance. Microsoft advises to test only business-critical applications, but let’s face it: this list can be very extensive. Furthermore, non-compatibility is not acceptable for any application if it is in use. 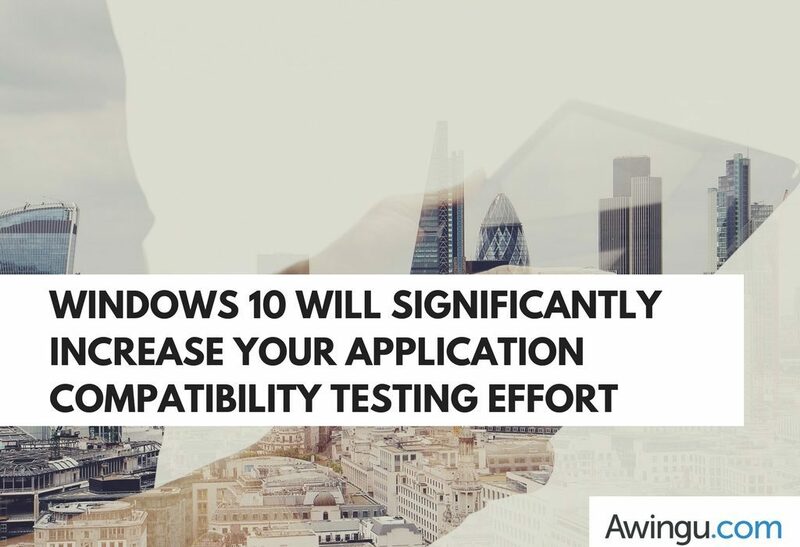 Windows 10 will create additional cost and effort to ensure almost continuous compatibility testing. This is where Awingu steps in. Awingu provides access to applications via the browser. Be it Microsoft’s Edge browser, or other browsers such as Firefox or Chrome. The applications themselves run in a centralized infrastructure. It enables a complete platform agnostic approach with the end-user device and OS. It means you can upgrade Windows 10, and get access to all the related benefits, at the rhythm dictated by Microsoft, but without all of the testing hassle. Besides, you could perfectly imagine adding other devices and OSs in the mix with Google Chromebooks or Apple MacBooks.